In early June I had a lesson with Scott Glen. I worked Seamus and Dot. It had been a year since Scott had seen Seamus, and two years since he’d had him in for training. I admit I’m completely envious of how easily Scott gets hold of Seamus’s mind, and gets him working thoughtfully and—dare I say it?—as if he’s actually a rather nice working dog. The pieces are there. I just don’t know how to hold them together. As Scott and I walked with Seamus out in the field to begin the lesson, Seamus was happily running a bit ahead of us, then returning to us, doing a small circle here and there; expressing his excitement to work by way of movement. Over the years, I’ve actually changed my opinion on this, going from demanding my dogs stay totally at my side, to realizing that this is not obedience and so allowing them to feel comfortable to trot or lope at a short distance from me, as long as their intentions are good; that is, as long as I know they are not actually going to take off for the sheep without my permission. Scott didn’t like this romping around at all, and put a stop to it immediately with a water bottle thrown towards (not AT) Seamus. It took Seamus quite by surprise, but he recovered and carried on with his happy frisking. A second bottle-bullet landing near him put a total stop to this; he came back to us and walked quietly with us. Scott told me not to allow Seamus to have “Happy Feet,” which is a totally apt description, and one I’ll remember! Seamus working with the right attitude! Photo by Regina Ireland-Auer. For the rest of the time we worked, Seamus worked beautifully and easily; no “fighting” with him at all. He offered the right behaviors, worked with the right intentions, and any mistakes he made were honest. My heart swells with happiness when he works like the dog he CAN be! I wished my sheepdogging friends had been able to witness his nice work, as it seems most people only get to see the cranked up, no-brain, 1000-miles-an-hour-no-brakes Seamus. L But that’s the point of the lesson; not to train the dog, but to teach me to handle the dog. We had two half-hour lessons, which I split between Seamus and Dot. When I brought Seamus out the second time, Scott worked him a bit more than he had in the first session, and helped settle him into slow, small flanks, which I can only occasionally get from him (since he is already doing everything too fast). It seemed to me that Seamus was working better than last year’s lesson with Scott (in which he worked beautifully as well), and better than the year before, when he had just come back from his months of training. Even though I need Scott’s help (or perhaps just his presence) to bring out the Thoughtful Seamus, I was really happy to see that he seemed to work better than he ever had. A point that was made to me is that I need to remember to allow him to get to the sheep’s heads at the top. I’ve no doubt that I’ve errantly been “practicing” trying to lie him down at the top too soon, since I’ve come to expect that he’s probably not going to lie down, or may lie down five strides later when it’s too late. I need to be more conscious of this (also something Kathy Knox has pointed out to me in the past; that he’ll lie down more easily if I’m being fair and asking him in the right spot!). Proof he really can work nicely without being up the sheeps' butts and pushing them at a run. Dot’s time was spent mainly inviting her to come in closer on her outrun. I’ve learned that whether she goes too wide seems to vary based on what field we’re in, as she was just right at the clinic down in Virginia, though she had the opportunity to go wide. Gene and I also tested whether it had anything to do with the sheep being held by someone, and this did not seem to be the case, so it must be the particular fields (and sheep) that cause her to go wide. In the lesson with Scott, we mainly sent her to the right, which is the side that she tends to run wider on. She headed for the fenceline. Scott’s guidance was to stop her, nicely invite her to walk up in on them, and as she comes in, flank her again. If she flanks out too wide, stop, call her in, flank her…lather, rinse, repeat. Eventually I should develop some sort of come-in command, but for now, the goal is to just get her more comfortable coming in. She was a good girl and tried to do all I asked. It’s always a pleasure to work her! Dot on a nice drive. Photo by Regina Ireland-Auer. The Pennsylvania State Championship Stock Dog Trial is traditionally held over Father’s Day weekend. The Open classes are typically on Saturday and Sunday. Open entries at this trial are tremendous, and with 92 dogs in Open, running started on Friday afternoon in order to get two Open trials completed. I usually like to drive out to see the running on Sunday, but this year I was assisting with the silent auction, a benefit for the 2013 National Sheepdog Finals, so I drove out on Friday afternoon to be there to set up on Saturday morning. A huge thanks to the folks who helped me set up, organize, and keep things under control throughout Saturday and Sunday: Lynn Johnston, Maggie Chambers, Rick (Emily Falk’s dad, I think? ), Cathy McClure, and Heather Millen. I truly could not have managed it without you! If I have forgotten anyone who gave me time and assistance, I apologize for my forgetfulness. Please know that anyone who pitched in is appreciated! A sampling of items under the auction tent. The novice classes (Nursery, Ranch, Pro-Novice, and Novice-Novice) are usually held on Monday and Tuesday. Because my dogs were going to be mostly crated from the time I drove out on Friday and through Tuesday, I was very concerned about how they might behave on the trial field. For the last few years of the trial, I’ve stayed at the bed and breakfast Inn the Beginning in Nicholson, PA. Ron and Marcine Carpenetti are the most lovely hosts! Across the street is a nice large hayfield where we can walk the dogs, and I took them out in the mornings before heading over to the trial field at Sheepy Hollow, and also before bed. There’s a small field at Sheepy Hollow not being used for sheep, so my friend Cathy and I were also able to let the dogs romp around there a few evenings after the trial. The novice days were run from highest to lowest classes, so the first dog I ran was Dot in Pro-Novice. 33 dogs ran on Monday. My mom came out to watch and cheer me on, but had a commitment later in the day, so this was the only dog she got to see. Unfortunately, we didn’t have the greatest outing. I apparently jinxed myself by asking a question at the handlers’ meeting about how to handle turning the post the wrong way. Someone had said that we were expected to “unwind” and go back around the correct way, but this has somewhat fallen out of favor, so I wanted to confirm what the judge wanted. I really had no concern about doing this myself. But asking the question apparently drew the eye of Sauron upon me, much like another trial in which I’d asked a question at the handlers’ meeting and then had the situation happen to me. No more questions at the handlers’ meeting for me! The course was set up shifted more to the left (closer to the creek) than I’d seen in previous years, making me reconsider the directions I’d chosen for my dogs’ outruns, though in the end I sent everyone the way I’d originally planned. I sent Dot to the right, as the field is pretty narrow, and with the fence there, she couldn’t really go too wide. I thought if I sent her left, she might get a bit hung up as she turned in because the sheep had been wanting to break back to the set out at the top right of the field. So, I sent her right and the outwork was okay, but I ended up going around the post the wrong way! I didn’t forget which direction to go, but I couldn’t get her to flank far enough to the away side to cover. The pressure after the fetch gates is mainly to the exhaust at the right, so she was probably unwilling to release that side. I think if I’d asked her to lie down and THEN flanked her, we’d probably have gotten them covered. Her lie down is very good, but in the moment, I didn’t think of that. I also didn’t think about how much more mobile I could have been at the “post.” I just leaned out and tried to stop them from coming to the wrong side—it wasn’t a huge miss—but I didn’t think about stepping out a crook’s length away from it or moving more around it. They got around the wrong side and in consequence we had a heavy point deduction off the fetch and drive. We got around the course, not quite as well as I expected, but we get through the entire course. Outrun 18, Lift 8, Fetch 2, Drive 8, Pen 9, Total 45 (of 80 possible). My next dog to run was Seamus in Novice-Novice, which had 17 dogs running. When I walked him before his run, I thought his attitude seemed pretty decent. He was obviously excited, but trying to keep it together. I had a little hope that he might behave reasonably. As we waited outside the field for our turn, I stood near the end of the blind. I hadn’t thought about the angle which allowed Seamus to see the sheep entering the exhaust, and when he saw a packet of sheep run up there, he got much more amped up and his attitude changed for the worse. I moved to a better spot along the fenceline where he couldn’t see anything, and tried not to add to his anxiety, but it was too late. Perhaps he just would have gotten more worked up while waiting for our turn, anyway. It’s hard to say. At any rate, when our turn came, I sent him out to the left, his outrun was good, his lift okay, and then it was non-stop from there on. I don’t recall him lying down or even slowing down anywhere at all. It was not pleasant. Somehow I still managed to steer him around the course, and I got myself to the pen. The sheep ran to the exhaust, he chased, I retired. And then he wouldn’t come off the sheep. Generally he has a good recall off sheep unless he’s literally in the midst of a full-speed chase, but not this time. Even though the sheep weren’t racing away from him, he would not come off. He ended up pushing them at a run down the fenceline along the bottom of the field, and the judge, Chris Bowen, came out to help. Seamus got in some cheap dives and tried for another when I finally got in the vicinity, and threw my stock stick between him and the sheep. Although the situation was serious in that he was harassing the sheep, his reaction to the stick was comical; his body folded up to avoid running himself into it, and his eyes cleared and he came to himself again in a sort of Mr. Hyde to Dr. Jekyll transformation. Bad dog. The scores up to our retire were Outrun 20, Lift 7, Fetch 12. No drive score although I was at the pen; either the judge didn’t feel we completed the drive or stopped scoring when he saw things going even more downhill than it had been with us racing around the course. I decided that the next day I would have to retire and go up the field to enforce a stop if he was acting the same way. The last run of the day was me and Dare. I sent Dare left, and as I expected, her outrun was tighter than Seamus’s had been. I think we managed to get them through the fetch panels, and she was going a bit faster than I like, but she was overall being a good girl. We got around the course and got the sheep penned, but the last one in turned and stood with its head and neck out of the pen. We can’t touch the sheep or use the pen gate to push them in, so I couldn’t close the gate. I should have put myself in front of the gate and encouraged her to turn around, but at the time I felt that my movement would have actually pushed her out, plus I have lost a couple points off the pen in past trials when the judge didn’t feel the dog did any work to get the sheep penned. So I flanked Dare away, but she didn’t stop when I told her to, and so she went too far and pushed them all out. Boo! They ran to the exhaust where she collected them and we penned again with no trouble, but of course it was a point loss. Outrun 20, Lift 10, (apparently our sheep left the set out so we got the default 20/10, though I didn't remember them leaving), Fetch 16, Drive 17, Pen 5, Total 68 (of 80 possible). The point loss at the pen cost us a win; the judge told me later he’d just told the scribe “no points off the pen” just before the sheep had popped out, resulting in the five point deduction. It was a little bit disappointing, but only a little bit. I was really very happy with our run. It was a good run for us, and this time I knew we’d earned our 2nd place, as compared to my mixed feelings about our win last month at Borders. We also earned the points needed to qualify for the NEBCA Novice Finals. Just a photo taken with my phone of Dare with her bling. Monday evening as I was walking in the hayfield with the dogs, I noticed that Seamus was moving oddly, kind of bunny-hopping. His hips have been evaluated OFA Good and PennHIP 90th percentile, so I thought maybe he’d pulled a muscle being such a goon at the trial, or perhaps was just stiff from so much crate time. He never really seemed to loosen up even after running and playing for a while, so I watched him again carefully on Tuesday morning. He seemed slightly better than the night before, but still not great. It wasn’t worth it to me to run him if he was lame, and combined with his crazy run yesterday, I decided it would be best to scratch him. Classes ran in the same order on Tuesday, and I was about two-thirds of the way down the Pro-Nov running order with Dot. Unusually, I was only a little bit nervous. I knew I could count on Dot to not do anything too crazy, and Dare had been a good girl the day before. The sheep had transformed overnight and on Tuesday were as quiet and agreeable as I ever remember seeing them at this trial. With Seamus’s unpredictability out of the picture, I had the very rare and very pleasant experience of being almost relaxed before a run! It was wonderful! 29 dogs went to the post in Pro-Novice on Tuesday. I sent Dot to the right again, and everything went as well as I knew it could. We had a bobble after getting through the drive gates. The course was slightly changed from Monday, and we were instructed to turn left after the gates (out of the course). Dot seemed to get mentally “stuck” as I flanked her with an away, and after a couple whistles, she did a come-bye flank instead, pushing the sheep the wrong way, which also pointed them towards the setout pen. They started to run towards the setout but I managed to get her to flank away and catch them, and also to bring them around the proper side of the panels on our line to the pen. We had a good pen, and I was very happy with our run! Outrun 19, Lift 9, Fetch 17, Drive 11, Pen 10, Total 66. I thought it was good enough to place but I was pleasantly surprised to learn we had placed 4th. 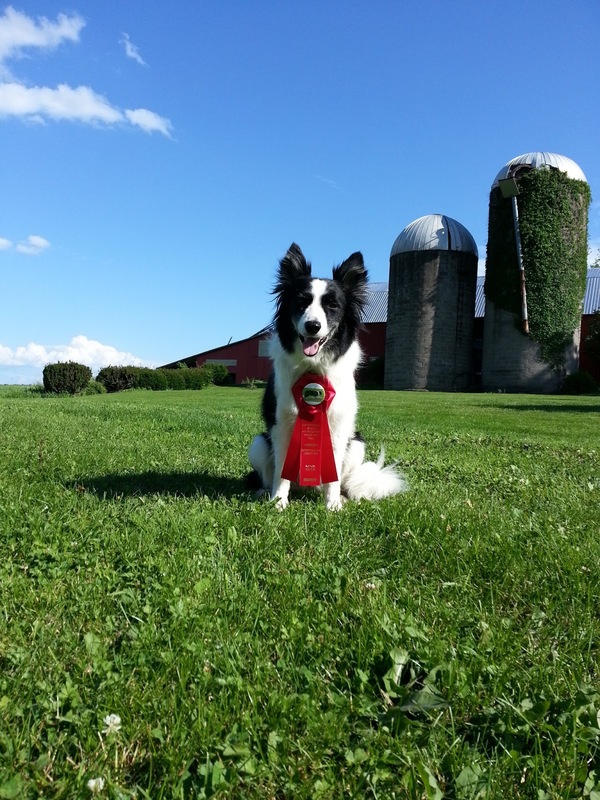 This qualified Dot for the NEBCA Novice Finals. so here's another of her working during our lesson with Scott. Photo by Regina Ireland-Auer. Nov-Novice had 15 runs on Tuesday, and Dare and I were last again. Dare was less relaxed than the day before, but I wasn’t expecting a crazy run, since the sheep had been so nice all day. We walked to the post, and our set of sheep came out of the pen running around, not willing to settle. I lowered my expectation of the run, waited till they were still, and sent Dare. As expected, things were moving along at high speed on this run. I managed to jockey everyone around the course in an unlovely way, and got to the pen. The sheep bolted for the exhaust, and Dare began a chase. At the Novice Finals last September, that scenario had ended up with a sheep running into the fence. To my immense relief, Dare DID lie down when I told her to. I let the sheep run to the exhaust and stop, and then I sent her. She collected them reasonably okay, brought them to the pen, and I don’t remember what happened, only that they ran for the exhaust again and she chased again. Miraculously, I got her to lie down a second time. I don’t recall whether she gathered them decently a second time and then had trouble, or whether the trouble was when she went around them the second time, but at any rate, she kind of busted into them and split them. I don’t know if there was a grip or not, but I chose to retire at that point. Outrun 17, Lift 7, Fetch 14, Drive 6 (ew!). It was quite a fun trial, with plenty of ups and downs. I was tired for a week afterwards! Saturday sunrise over a foggy hayfield at Inn the Beginning. The peaceful yard and garden at Inn the Beginning. The photo didn't quite capture the golden glow of the sunrise, but it's not bad. The barn at Inn the Beginning, as seen from the hayfield. Sunday sunset over the B&B's neighbors. Hidden treasure? Plymouth resting in the shed at Ron and Marcine's.